Archaeology. Animals in the ancient world and today. EDIT: We are going to repeat the event this year, so come along on March 16, 2019! This Saturday, March 17th, Jess Beck and I are going to have a stall with animal bones as part of the Cambridge Science Festival. What better way to spend St. Patrick’s Day than in the name of animals? Deer, to be more specific. The festival has the theme of Sense this year, and we’re focussing on the sense of touch in our display of deer bones. We’ve added colour, of course. This was a messy affair, but totally worth it. 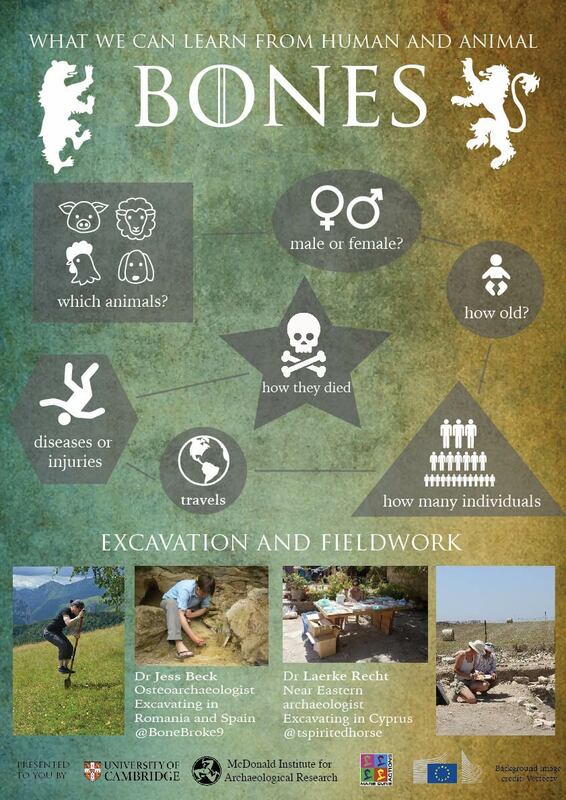 We hope it will get kids (of all ages) an idea of some of the many things we can learn from studying bones. First of all, we want them to have lots of fun with it. The display will have four different interactive activities, developed by Jess in her previous work (in other words, big thanks to her for sharing!) If you’re interested in how to set up something similar, check her upcoming detailed blog post on the topic. Jess tested me in all of these and I loved it (I may also have failed in one due my superpowers in anything related to numbers). One of the first things done when finding a bone in an archaeological context is to identify what part of the body it belongs to. The game is here to use the sense of touch to decide which bone is hidden in a box. It is one of three long bones: upper arm (ulna), thigh (femur) or foot bone (metatarsal). Each has a different shape and ends which help identify it. The spinal column has three types of vertebrae: cervical, thoracic and lumbar. This game is about grouping the three types. Cervical vertebrae are those nearest the head (they also include the atlas and axis) and have sort of a squarish/bulky shape. Thoracic vertebrae have a long part sticking upwards, like a dolphin’s dorsal fin. The lumbar vertebrae are those closest to the pelvis, and they can be recognised by their two ‘wings’. Unlike long bones, vertebrae cannot be sided, since the form the centre of the body. The number of vertebrae depends on species – for example, deer have seven cervical, 13 thoracic and six lumbar vertebrae, while humans have seven cervical, 12 thoracic and five lumbar vertebrae. The first activity is about age. There are various ways of trying to determine age using bones. One is the presence or absence of fusion. For example, a long bone consists of a shaft (the long part, technically the ‘diaphysis’) and ends (‘epiphysis’). At birth, the shaft and the ends are not completely fused. This happens at different stages depending on the type of bone and the human/animal. Osteoarchaeologists and zooarchaeologists have developed precise tables for the species and type of bone, and the time interval at which they fuse. Fusion usually happens fairly early in life (within the first three years, again depending on the animal and bone), so if a bone is found unfused, we can say that it came from a very young individual. So, in this activity, we have several sets of long bones (ulna, femur and tibia) that have not fused yet. The game is to fit the unfused ends (in green) to the shaft. A simple but fun puzzle. The second activity is a numbers game. In archaeological contexts, we rarely deal with complete animal skeletons – and even human remains are often found all mixed up (commingled). But it is still very useful to know how many individuals are represented by the bones that do survive or are present. 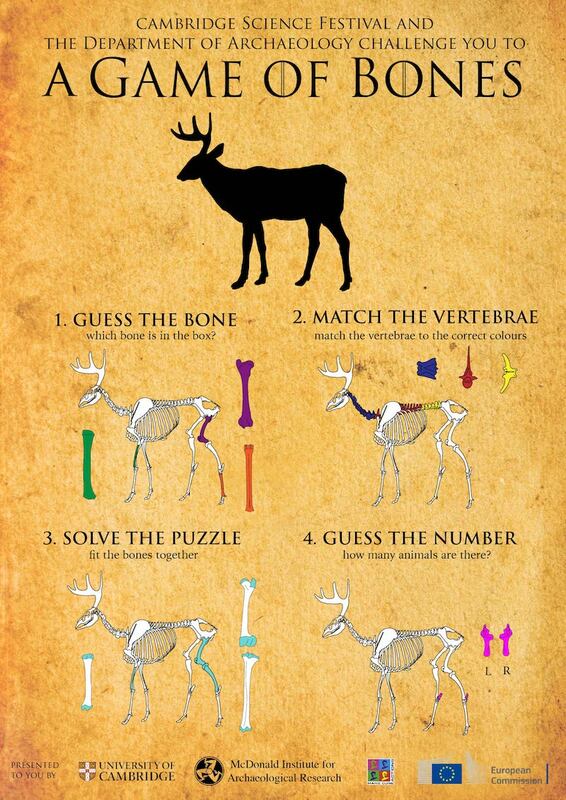 For this, two basic ways of counting are used: the number of bones (NISP, Number of Identified Specimens), and the minimum number of individuals (MNI) represented by those bones. The first one is fairly easy. Just count all the bones. The second can be trickier. All limbs bones can be assigned to either the right or the left-hand side of the body. Of course, any one individual can only have one right thigh bone and one left thigh bone. We can use this to count how many individuals were present. For example, if there are five thigh bones of the same type, you might initially say that we have five individuals. But if three of the bones are from the left side, and two from the right, we can instead say that in fact several of the bones belonged to the same individuals, and so the minimum is three. For the purpose of this activity, we have tried to keep it simple by only counting in this way. However, the numbers can be further fine-tuned by taking into consideration the age of the bones, and compare to other bones from the same kind of animal. Remembering the idea of fusion, if one of the right thigh bones has not yet fused (but all the others have), we instead have a minimum of four individuals. Various other factors can help in this kind of calculation. It is extremely useful because it can make a world of difference to how we interpret a site whether we can see that 50 or 100 cattle were brought to a site (say, for a big feast). The bones used here are the heel bones (calcaneum); Jess has a super useful blog on siding of this particular bone. If you’re around Cambridge, do come visit! There will also be displays on pottery, stone tools, ancient food and much, much more. It’ll be lots of fun, and I promise there will also be green to celebrate the day.